This is a guest post by Sara Williams who blogs at Debt Camel, covering everything from improving your credit rating before getting a mortgage to deciding if an IVA is right for you. In one of the richest countries in the world, no one should be hungry at any time of year. But there is something almost obscene about parents worrying about how to feed their children at Christmas or people being alone with no food whilst the rest of the country over-indulges, eating a week’s worth of calories in a couple of days. If you would like to help your local food bank, join the UK Money Bloggers in collecting a Reverse Advent Calendar this year. It’s a great way to show your children that Christmas is a time for giving, not just getting. School holidays are often difficult for families on low incomes, having to feed their children who would have been getting free school meals. At Christmas the problem is worse, with the extra heating costs. And this year thousands of people applying for Universal Credit for the first time will have to get through the six or more weeks waiting period at the start. Even if they can get an advance payment during this time, it will only be half of what they should have, forcing them to choose between food, heating, paying the rent and getting into debt. Foodbanks do their best to fill this gap. December is their busiest month of the year, with 45% more referrals from CABs, Job Centres, GPS and Social Services during the two weeks before Christmas. More than 90% of the food Trussell Trust distributes comes from donations from the public. With an Advent Calendar, you open a window each day from December 1st to Christmas Day and get a reward. It used to be a tiny picture or a chocolate for children, now adults can indulge themselves with everything from nail varnish to beer advent calenders. You make a donation a day in a Reverse Advent Calendar. Get an empty box, then put one item for your local food bank into it every day. You could do this for 25 days to mirror the advent calendar – or perhaps for a whole month. You can find your local Trussell Trust food bank on this map. There will be a local website with contact details – email address and telephone number – so you can check where to take your box to and when. Your local council or Citizens Advice may have details of other food banks in your area. Read Trussell’s Trust’s What goes in a food bank parcel to see the sorts of things you can pick. It’s mostly tinned or dried food as it has to all be long life. If you aren’t sure, check the Use By date on the item, and make sure it’s several months away. Children may want to fill the box with mince pies, chocolates and snacks – the sort of special food they think of as being for Christmas. But food banks also need “the boring stuff” – cereals, tinned fruit and vegetables, rice etc. If you look your local food bank’s website there may be a list of things they most need. The one on the right is from my local one – it’s not the national list. If you want your donation to be used for Christmas, get it to your local food bank in early December. Christmas Eve is too late – especially as it’s a Sunday this year! Getting donations early lets food banks sort the items and get them to where they are most needed. Collecting through November and delivering the donations in the first week in December would be the best timing. If you want to collect during Advent itself, then your donations will be just as welcome in January. If you do a reverse advent calendar box this year, why not put a photo of it on Facebook, Instagram and Twitter to encourage your friends to do the same? 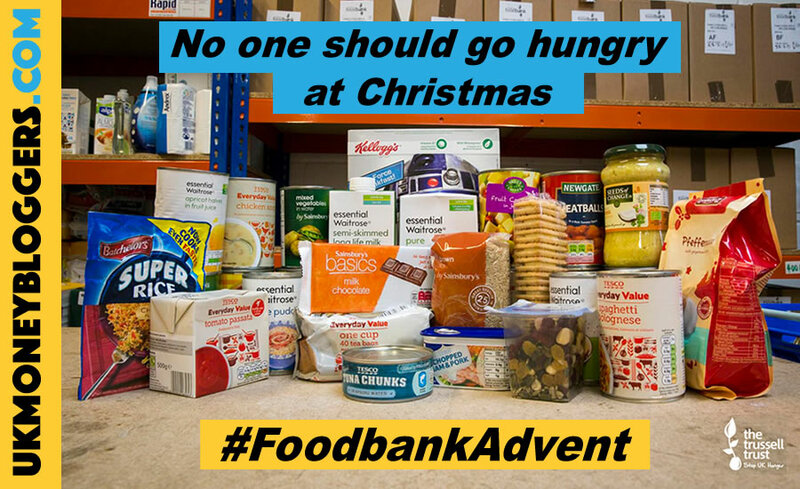 Use the hashtag #FoodbankAdvent. Solving poverty, low and erratic wages and benefits problems needs action from the government, but we can all do a small bit to make sure no-one goes hungry this Christmas, one box at a time. Want some ideas of what to contribute? See what some of the UK Money Bloggers have been collecting so far. Plus, there are a number of money bloggers sharing their #FoodbankAdvent ideas on their own blogs. You can check out their articles in the comments further down the page or in the thumbnails below. Pingback: Reverse Advent Calendar Campaign- Will you be taking part? Love this. Have shared the Mirror article on Twitter and said to my family that we should all do it. I enjoyed putting my reverse advent calendar together: such a small amount of time, effort and expenditure, but it can make such a difference to somebody’s Christmas. I’m really proud to be involved in this, it’s a fantastic cause. Brilliant idea – I hope a lot of people participate in your campaign. I hope you don’t mind but I’ve included a link to your site in my latest blog on how a caterer can help the homeless and foodbanks: http://www.catering-online.co.uk.